Open Monday - Friday 8:30 AM - 6 PM. Saturday 8:30 AM - 4 PM. Sunday 10 AM - 4 PM. 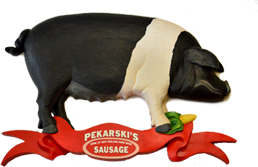 The product for which we are best known, produced from a recipe developed by the original Pekarskis who founded our business. Available throughout the year, especially popular at Christmas, Easter, and Thanksgiving. Our version of the sausage that originated in the south of Italy, mainly in the region from Naples to Calabria. OPEN: Monday - Friday 8:30 AM - 6 PM. Saturday 8:30 AM - 4 PM. Sunday 10 AM - 4 PM.